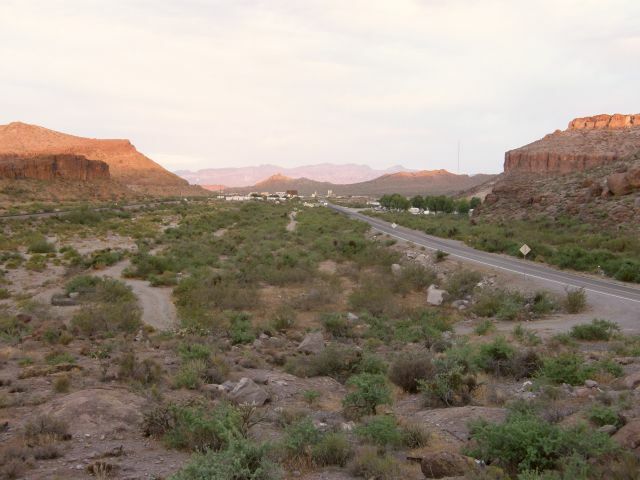 Before the dawning of the generic age made manifest in I-40, Route 66 was a magic carpet of asphalt that swept the westbound traveler from the land of enchantment through a portal of towering stone escarpments into another world and another time. For years, these walls of stone served as a backdrop for a massive billboard that proclaimed “Northern Arizona Greets You,” and entranced the eye with a colorful portrait of the Grand Canyon bordered by lists of attractions and sites awaiting discovery on the road ahead. There was no time for the mind to process the wonders that embraced that ribbon of asphalt, or the wonders promised on the road ahead as colorful trading posts nestled against the rocks assaulted the senses with brightly colored signs promising all manner of souvenirs and tasty treats. With scenes such as this unfolding in the rear mirror, and the vast, multihued landscapes of the Painted Desert stretching to the far horizon only the press of the traffic on the narrow sun baked road that followed the twists and turns of the tortured lands could break the spell of awe and wonder. ﻿In Holbrook, the neon may have dimmed but at Jo and Aggie’s Café, good food still is served, and you can still spend a restful night in a whimsical teepee at the Wigwam Motel. Logs of stone and brilliant star lit skies are the link that bridge the past and the present. As the westward journey continued, looming snow-covered peaks grew larger on the horizon as the old road skirted meteor made craters, trading posts, and passed over twisted labyrinths of stone that seemed bottomless in their depth, and through the dusty streets of Winslow. Here to the road is broken but the spirit remains in the Jackrabbit Trading Post, in Meteor City, and the Geronimo Trading Post. The neon has also dimmed in Winslow, and the generic has swept away the unique. Yet, tarnished gems such as the La Posada Hotel remain as portals to an era when the double six was a dusty trail and the railroad was still king. Then it was the crush of traffic in Flagstaff, an island in a sea of towering Ponderosa pines, where the frontier and the modern era overlapped seamlessly. Today, the traffic, the trees, and remnants from the frontier era remain as backdrops for a staggering string of time capsules from the era of the Edsel and the tailfin. Here the running horses and turning wheels framed in neon still shine bright at the Western Hills Motel and the Museum Club is still the roadhouse of choice. 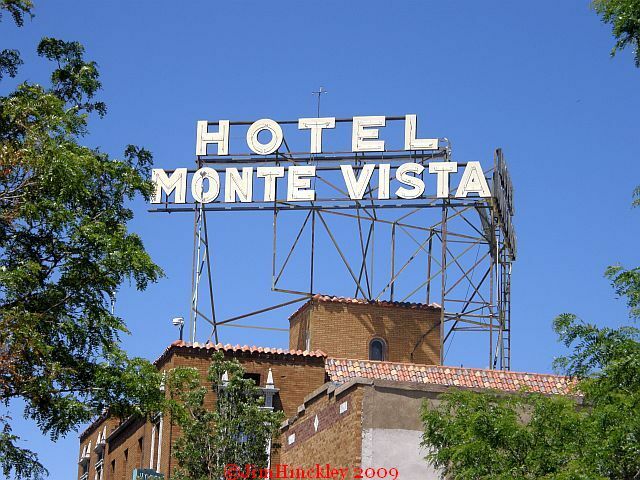 In Flagstaff, the Wonderland Motel is still the “Motel with the View,” and the Hotel Monte Vista still serves guests as it has since its opening in 1927. Shattering the preconceived notion that Arizona was a land of sun-scorched rocks, sand, and cacti was the drive west was over a shade dappled road where a hint of pine dances on the breeze. Today, the old road is segmented but for those who seek its path, the rewards are many, Parks Store, the Deer Farm, and the two story log cabin that was the McHat Inn are but a few. In Williams, the garish and modern stood in stark contrast to the ornate and solid. Little has changed except now the ornate, solid buildings from the territorial period is now considered the historic, and what was once garish and modern is now seen as classic. Both coexist in the time capsule bound by Route 66 that is Williams. However, the last community severed from the lifeline that was the highway signed with two sixes when I-40 opened on October 13, 1984 never surrendered. Rod’s Steak House still serves great food and the big neon lit cow still shines bright as it has since 1946. An 1897 bordello now is a bed and bakery. The Frey Marcos de Niza Hotel serves guests as it has since opening day in 1908, and the railroad still runs from the depot to the Grand Canyon. Old Smoky’s Pancake House, as it has since opening in 1946, still provides travelers with a breakfast suitable for a farmhand and at a bargain price. From Williams old Route 66 plummeted toward the desert in a sweeping series of curves where awe-inspiring vistas were the reward for the white knuckle, brake-burning descent. I40 sliced through the highway like a knife between Williams and Ashfork but the old curves remain as overgrown scars on the hillside and the empty truck stops as ghostly reminders. Ashfork was a railroad town birthed when Arizona was still a territory on the western frontier and Route 66 was an interloper. Now, the railroad is but a dusty memory, vestiges of Route 66 are the tarnished gems sought by adventurers, and soulless I-40 is the passage of choice for those motoring west or east. 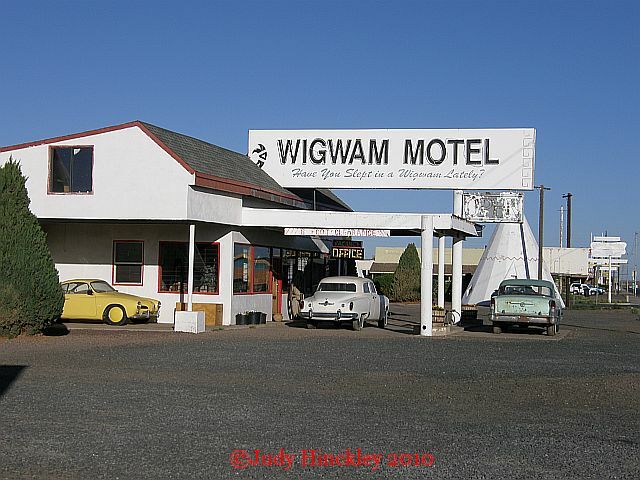 Seligman was a boomtown fueled by cattle, the railroad, and the endless river of traffic that flowed east and west on Route 66. It was a western metropolis in miniature – until that day in 1978 when that river was diverted to the super slab south of town. Seligman, like Williams, stumbled but never succumbed. In 1987, with a fearless little barber named Angel Delgadillo as their leader, the town fought back and the Route 66 Association of Arizona was born. Like the mythical Phoenix rising from the ashes, Seligman is now a crown jewel in the era of rediscovery that marks the newest chapter in the history of legendary Route 66. 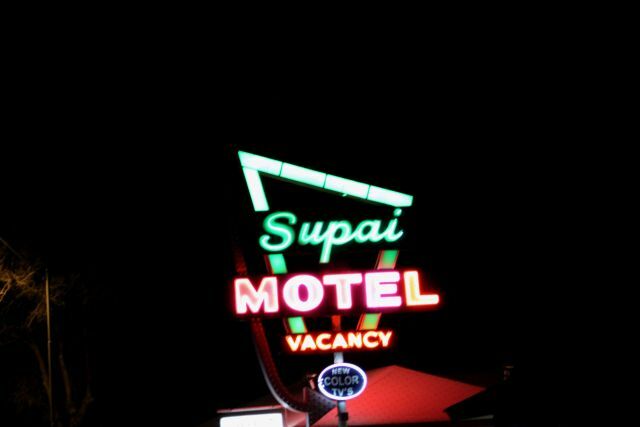 Refurbished neon again glows bright at the Supai Motel, the Snow Cap Drive In and Angel’s barbershop are internationally recognized destinations, and Seligman Sundries meets the needs of travelers and locals alike since they have in 1905. Every year, on the first weekend in May, the curtain between past and present becomes a thin veil as the streets again fill from end to end with a sea of glittering chrome. This is the Route 66 Fun Run, a celebration of the life and times of that legendary highway, an opportunity to turn back the clock and cruise the longest remaining uninterrupted stretch of that highway. The road west across the wide Aubrey Valley, and on to Kingman, and the landscapes that embrace it have changed little in the past sixty years, seventy, or even eighty years. Only the forlorn ruins interspersed with time capsules such as Grand Canyon caverns and the Hackberry General Store, present the illusion this is a weathered tapestry worn thin with the passing of eons. In Kingman, legendary 66 shares center stage with the town’s favorite son, Andy Devine, and with every turn of the wheels on the westward journey through town, the clock rolls backward. It begins with the trappings of the modern era that soon give way to vintage motels of the 1950s and 1960s that soon give way to vintage motels of the 30s and 40s. Then the mist of time part and Route 66 becomes a portal to territorial Arizona, and the heady days of early statehood sprinkled with colorful reminders that this is the Main Street of America all set against a skyline of stunning buttes and mesas. Gaunt and empty the Hotel Beal with its towering “Air Cooled” sign still cast long afternoon shadows over Route 66, the old depot has been reborn, and the old Kimo Café has been transformed into a colorful, whimsical romanticized image of all that Route 66 once was named Mr. D’z Route 66 Diner. The crown jewels in this tarnished crown are the Powerhouse Visitor Center and Route 66 Museum, and the mammoth 1920s era Baldwin mountain locomotive in the park. 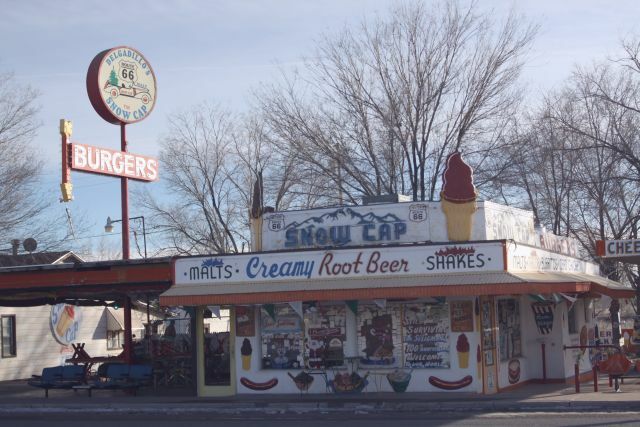 In Kingman, Route 66 is the crossroads of the past and the future. West of Kingman, two different alignments of Route 66, its predecessor the National Old Trails Highway, and east as well as westbound tracks for the Santa Fe Railroad, press together in the narrow canyon before pouring forth into the wide Sacramento Valley. In the valley, almost a century of motoring history awaits discovery. 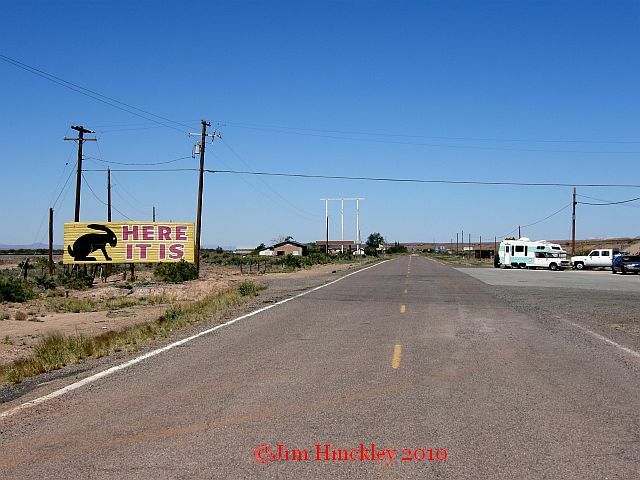 To the right there is the last incarnation of Route 66 that blends almost seamlessly with I-40, as both were four lane wonders that whisked people through the dusty little town of Yucca and to the Colorado River, gateway to the Golden State. To the left is the Beale Wagon Road overlaid by the National Old Trails Highway, overlaid by the Route 66 of the Great Depression. The scant ruins of Yucca with the classic roadhouse that is the Honolulu Club, towering signs that cast long shadows over empty fields where truck stops and motels once stood, and a giant golf ball standing in silent testimony to a dream that never came true are found to the right. To the left are the steepest curves, the sharpest curves found anywhere on Route 66, the resurrected time capsule of Cool Springs, the ruins of Ed’s Camp, a ghost town reborn with burros in the street, and stunning views at every turn. After the twists and turns of the pre 1952 alignment in the Black Mountains, the gentle curves that caress the flanks of the mountains on the descent to the river are almost anticlimactic and in an instant, an oasis appears. To the south, the sterilized Route 66 and I-40 whisk the motorist to the river with all the flare and excitement of an escalator. 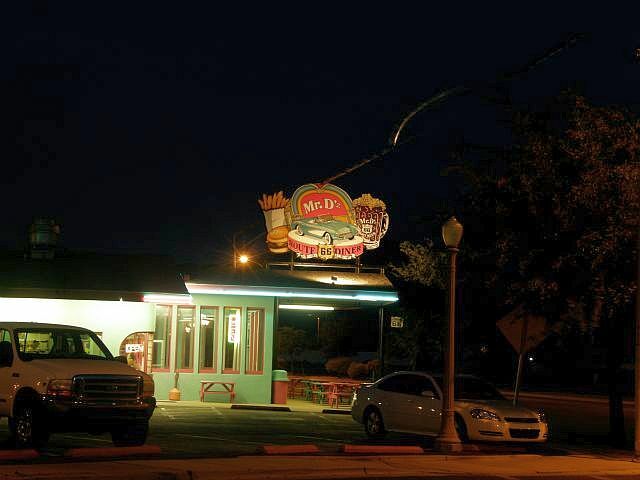 Route 66 in Arizona, before the dawning of the generic age, was a road of wonder. Route 66 in Arizona, today, is the road of discovery. Route 66, then and now, is the stuff of dreams where reality and fantasy, the past and present, are found in every mile. Nice Locomotive Park, Museum Club i like these place with my asphalt.